We get it. You’re a chip off the old block. Maybe it’s the way you talk or your subtle mannerisms that remind people that you’re truly your father’s child. Maybe it’s the beliefs you’ve inherited from your old man; his wisdom shaped who you are and he is one half — along with mummy dearest, of course — of the ultimate duo who brought you into this world. We fully relate to the gratitude and love you have in your heart for Dad. (We think our fathers are pretty great too!) And though Iron Man and Captain America might seem to be great figures onscreen with sci-fi technology and superhuman strength, we think that fathers still take the top spot and are the biggest, most loving hero of them all. Even then, heroes deserve a break every once in a while. And what better way to reward our champs than with an ultra-lux ride on the luxury Royal Albatross? The Royal Albatross is massive and uniquely stylish. It is a 4-mast, 22-sail luxury ship that rides the waves like nothing else. Its rarity is also something to boast. Being one of 150 remaining tall ships in the entire world and the only luxury tall ship in the region, you will be immersed in exclusivity and class on board the Royal Albatross. And if that’s not enough, the tall ship was even featured in the 2008 Batman film, “The Dark Knight”. A monster of a vessel, we’re confident that the Royal Albatross’ imposing frame will make even the Joker weep. On top of the Royal Albatross’ rich history in pop culture, the cruise experience also provides a panoramic view of Singapore’s pristine southern coasts. If Dad is an outdoorsman with a taste for adventure, or if he’s simply a nature-lover or a sailing enthusiast, rest assured he’ll appreciate the breathtaking spectacle Mother Nature has to offer. From turquoise waters to lush, untamed greenery, the islands surrounding Singapore is truly a sight to behold. After a long day of bonding together, one will inevitably develop a hearty appetite. Onboard the Royal Albatross, we aim to please. Being foodies ourselves, we’ve thoughtfully curated a selection of courses in food platters for your Father’s Day dinner. From the traditional British roast to delicious samosas, the succulent dishes available will satisfy your cravings for a hearty meal with Dad. Not only that, the ship’s warm and cosy Grand Salon offers an exquisite collection of cocktails. Our bartenders are well versed in the art of mixology and they’ll make the transition from “signature” margarita pizzas to actual margaritas a breeze. The truth is for most days, both you and Dad are out about your own schedules and routines at work or perhaps school. Dinner might be a weekly or monthly affair. Perhaps you and Dad may not be spending as much time as you’d like or conversation runs almost daily. 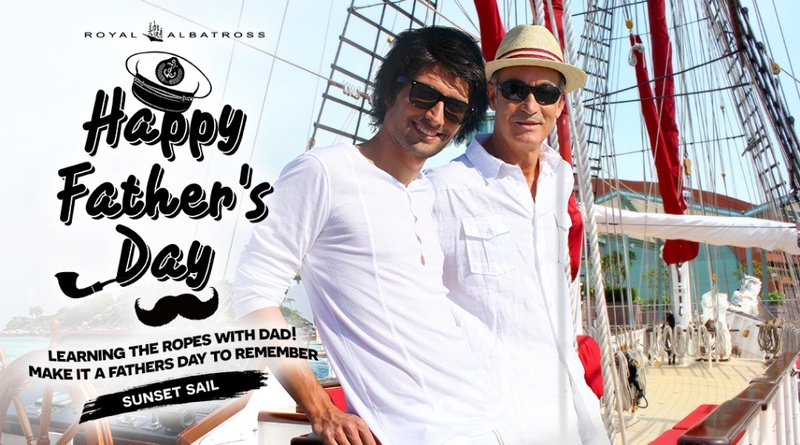 Either way, celebrating Father’s Day on the Royal Albatross is a unique and excellent opportunity for Dad and yourself to bond, relax and spend some much needed time with one another. Make a booking with us for Father’s Day today — The Royal Albatross awaits! Select 17th June from the booking panel now! Enhance your sailing experience with the best seats on the upper foredeck and be pampered with a plated three-course dinner, a welcome drink and dedicated servers to look after you and any special requests. Highly recommended for an extraordinary and intimate dining experience, romantic surprises and for families who welcome privacy. 4 Dinner Cruise tickets with 2 complementary mast climbs. Perhaps you and Dad may not be spending as much time together as you’d like or you're looking to do something memorable to share. Either way, celebrating Father’s Day on the Royal Albatross is a unique and excellent opportunity for Dad and yourself to bond, relax and spend some much needed time with one another. Interested in the complexities of sailing a Tallship in the busiest port in the world? Under supervision take the helm of our magnificent sailing ship and learn more about Royal Albatross. Although an ancient relic on the outside, beneath the surface, she is state of the art with the latest control, navigation and comm systems. Limited availability so book early! The adventure package is subject to Mast Climb Requirements.